Author Visit: Jen Campbell | Live to read. Read to live. Spirits in jam jars, mini-apocalypses, animal hearts and side shows. A girl runs a coffin hotel on a remote island. A boy is worried his sister has two souls. A couple are rewriting the history of the world. And mermaids are on display at the local aquarium. 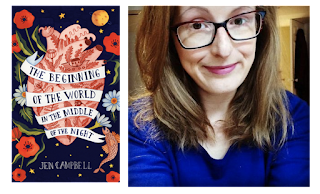 So a couple of weeks ago I asked the lovely Jen Campbell to sit down and have a slice of pizza and chat with me* about her short story collection The Beginning of the World in the Middle of the Night which is published today. This is how that chat went. *I say ‘with me’ but actually real life prevents Jen and I from eating pizza together as often as I’d like so what I actually mean is she was there and I was here although in my case the pizza was in no way hypothetical. 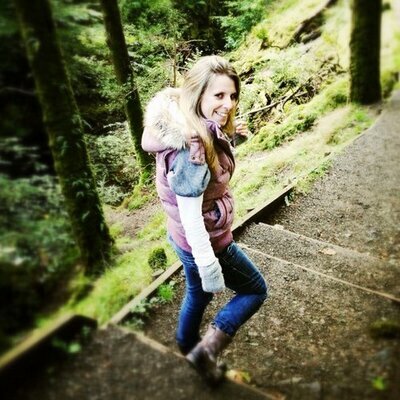 Jen! You absolute gem, thank you so much for taking the time to talk to me about The Beginning of the World in the Middle of the Night. Before we get started, let’s warm up with a quick fire round. I think you’ve done this before but whatever – I want to see if your answers have changed. 8. If you could jump to any point in history, who would you have dinner with? Right now, you. 9. What are your pet peeves? People being inconsiderate. 10. Talk to me about fairytales. 100 words about why you love them so much. GO. Fairy tales are fascinating because they belong to all of us. They are living breathing things that have slithered their way through history, evolving and changing to suit social climates. WELL THAT WAS FUN (also some of your answers are the same which is excellent. Also, can we actually have dinner please, sometime relatively soon?). Anyhow, on to the proper bookish stuff which is obviously the most important part. Firstly, I’ve read The Beginning of the World in the Middle of the Night (and I loved it, by the way, so much) but for anyone who’s yet to get acquainted with the book, can you tell us a little bit about it? It’s a collection of twelve haunting tales, many of which are inspired by fairy tale. 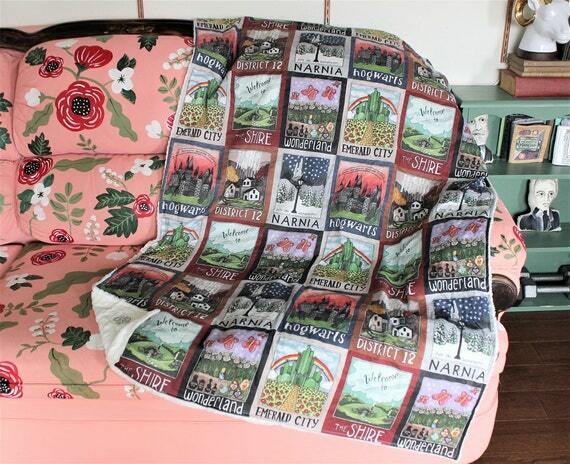 They are not fairy tale retellings; they are stories about characters who are obsessed with storytelling. These characters use stories to root themselves, or find themselves, or explain questionable things they’re doing. That might be purchasing hearts online, or running a coffin hotel, or working in a night-time aquarium where women dress up as mermaids. The book feels like a modern fairytale collection, full of whimsy and magical realism, sometimes funny, sometimes heart-breaking and always deliciously strange. Where did the ideas come from? The title story is definitely inspired by some middle of the night conversations Mr M and I have had, though I wouldn’t say the characters are based on us specifically. There are a few characters I’ve pieced together from real-life encounters. All writers are magpies like that. I’m not sure if I have a favourite character… it would feel mean to pick one. Which of the stories is your favourite? Do you even have a favourite? Is it mean of me to make you choose one? CHOOSE ONE. Again, that is mean ;) I have been keeping a tally of other people’s favourites, though. Margaret and Mary and the End of the World seems to be winning right now. How do you name your characters because I feel like you don’t just go through one of those baby name lists and pick at random? Cora (from the first story, Animals) - is another name for Persephone, who was abducted by Hades and kept in the underworld. Libitina (Aunt Libby’s Coffin Hotel) is the Roman goddess of funerals and burial. Ankaa (from the same story) is the brightest star in the constellation of Phoenix, a bird who is constantly reborn. Margaret, Mary and Gretel are all forms of the same name (Margaret and Mary and the End of the World). If The Beginning of the World in the Middle of the Night was a DVD what would the special features be - are there any scenes that ended up ‘on the cutting room floor’ or story ideas that didn’t quite make it that you can share? From a purely selfish point of view, because I kind of have attachment issues and struggle to let go, will we see more from any of the worlds you’ve created here? Follow up stories, expansions into novel(s) etc? For the love of all that is good give me more of Plum Pie or Aunt Libby’s Coffin Hotel. I honestly don’t know - ask me again in a year or so. The Beginning of the World in the Middle of the Night is your second book release since the end of the summer – you don’t make life easy for yourself do you – how did working on this book, from the initial concept to publication - differ to Franklin’s Flying Bookshop? It’s difficult to compare the two, as they’re very different. I’ve been working on these stories for the best part of three years. At first I was crafting them while doing other writing projects (such as Franklin) but after getting a book deal for them in summer 2016, I focused on them for the following seven months. It was a bit of an intense time. Do you write every day? What is your routine? What advice can you offer those of us that would love to write? I do lots of different things (running writing workshops, a Youtube channel, judging literary prizes etc) as well as writing so, no, I don’t write every day. It all depends on my schedule and what project I’m focusing on/when deadlines are. My advice is to write as much as you can, whenever you can. Make the time for it, as it’s not going to happen on its own. Use prompts if that helps. I run writing workshops if that’s of interest (www.jen-campbell.com/writing-workshops). Edit your work until it’s good. Keep coming back to it. Read your work out loud to help you notice any flaws. Read other books. Then read some more. I feel a little bit like short story collections don’t always get the love or even the recognition they deserve and I know you read a lot of them. What are your top three? & because I’m always on the lookout for new book recommendations, what are you reading right now? Eight Ghosts by Max Porter, Sarah Perry, Jeanette Winterson etc. What’s the best book you’ve read this year, and what should we be keeping our eyes peeled for? Mend the Living by Maylis De Kerangal is the best book I’ve read this year. You should all keep your eyes peeled for Winter by Ali Smith. Finally because I feel like I’m going on a little bit, what’s next for you? Other than a well-deserved rest? A novel… probably… but I think I need to have a few more cups of tea, first. Thanks Jen, and mahoosive congrats on the book. Hurrah. The first thing I did after this chat was get me a copy of Mend the Living. The first thing you guys should do, assuming you haven't already, is get yourselves a copy of The Beginning of the World in the Middle of the Night. It's out today.